With his 1956 play Look Back in Anger, John Osborne famously kick-started the theatrical trend for 'Angry Young Men' and drama that put society's discontents at centre-stage. 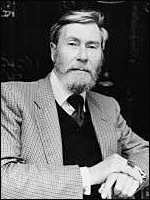 Although primarily known as a playwright, Osborne (born on 12 December 1929 in Fulham, London) also made significant contributions to British film and television. Both Look Back in Anger and the 1957 play The Entertainer were filmed by their stage director, Tony Richardson (1959 and 1960). They were produced by Woodfall Films , a company founded by Osborne and Richardson when they failed to secure funding for the first film. These and much of Osborne's subsequent stage work have also been produced for television. Amongst a body of further stage plays, Osborne also produced a clutch of original screenplays. His first television play was 'A Subject of Scandal and Concern' ( Sunday Night Play , BBC, tx. 6/11/1960), also directed by Richardson. It was an unusual drama-documentary, interspersing its drama with presenter John Freeman narrating straight to camera. It dramatised the case of George Holyoake, an atheist who, in 1842, became the last man to be imprisoned for blasphemy. In 1963, Osborne dramatised Henry Fielding's bawdy novel Tom Jones for Richardson's colourful production. With Albert Finney in the title role, the film was a massive success, winning Oscars for both Osborne and Richardson. Osborne later completed a screenplay for Richardson's The Charge of the Light Brigade (1968) but, due to copyright issues, a lawsuit and a bitter falling-out between the two, it was abandoned and replaced with a script by Osborne's friend Charles Wood . Other adaptations by Osborne include a polished version of Oscar Wilde's 'The Picture of Dorian Gray' for the BBC ( Play of the Month , tx. 19/9/1976). 'The Right Prospectus', for the BBC's Play for Today (tx. 22/10/1970), was a satirical piece in which a wealthy couple disguise themselves as schoolboys to infiltrate a public school. The Daily Telegraph critic found it "not merely the most distinguished original television play of the year, but one which will linger uneasily in my mind for years ahead". 'Ms or Jill and Jack' ( Late Night Drama , ITV, tx. 11/9/1974) was a short and popular drama which inverted ingrained 1970s gender roles. Hot on its heels came The Gift of Friendship (ITV, tx. 24/9/1974), a play about the bitter relationship between two ageing writers. 'Almost a Vision' (ITV, tx. 1/9/1976), one half of a Wednesday Special double-bill, was a short piece showcasing the talents of Osborne's then wife, actress Jill Bennett . 'You're Not Watching Me, Mummy' ( Playhouse , ITV, tx. 20/01/1980) concerned the hollowness of an actor's existence. Very Like a Whale (ITV, tx. 13/2/1980) was written in 1971 but took nine years to be produced. Taking its unusual title from Hamlet, it concerns a business tycoon who finds himself becoming increasingly isolated as he accumulates wealth and honours, much like Osborne himself. God Rot Tunbridge Wells! (Channel 4, tx. 6/4/1985), subtitled "the true story of G. F. Handel ... occasionally", was a biographical drama commissioned to mark the tercentenary of the composer's birth. In a similar vein was England, My England (Channel 4, tx. 25/12/1995), a biography of Henry Purcell . Barely begun by Osborne when he died on 24 December 1994, it was completed by Charles Wood and credited to them both. An experienced actor himself, Osborne also appeared on television and film on numerous occasions. Most notably, he played a gangster in Get Carter (d. Mike Hodges, 1971) and Werner, an angry young German, in David Mercer's 'The Parachute' ( Play of the Month , BBC, tx. 21/1/1968).